Spaghetti isn’t always about being tomato sauce and meatballs. 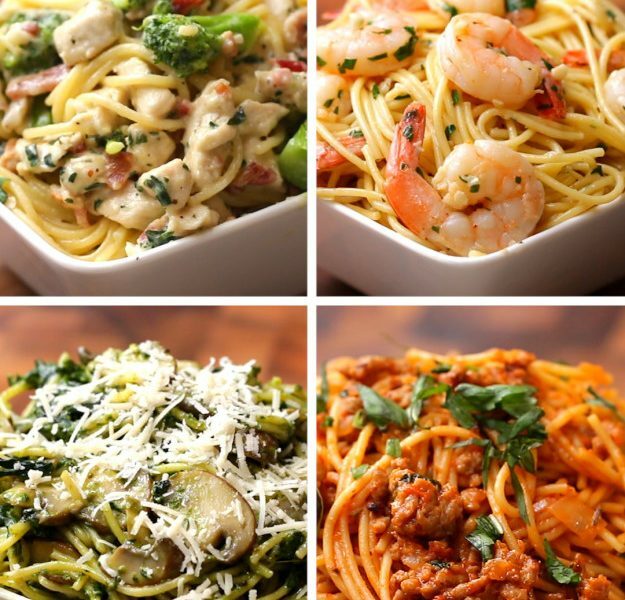 This Buzzfeed video will show you why pasta can be mixed with varieties of sauces that can even surprise you. Pasta can be creamy and milky with chicken and broccoli and create the tastiest Chicken Bacon Broccoli Alfredo! You can also discover the rich taste of Garlic Shrimp Scampi with lemon juice as flavouring. Green pastas can be ideal for the family too with Spinach Mushroom Presto. Lastly, we can try the classic Tomato Basil Sausage. Cook the garlic until it starts to brown. Add the shrimp, salt, and pepper, cooking until shrimp is pink all the way through. Add the lemon juice, chili flakes, and parsley. Add the spaghetti, and toss until evenly coated. Cook the sausage in a pot over medium-high heat. Add the onions, salt, and pepper, cooking until the onions are translucent and sausage is starting to brown. Add the marinara, milk, and basil, cooking until sauce has thickened slightly.